Once a year, during the Travellings festival, European art takes over the Aygalades neighbourhood in Marseille. It's a unique opportunity for street artists and those living in the working-class neighbourhood to cross paths. Night-time has just started to fall as we go through a highway underpass in the projects of France's second largest city, Marseille. On this September evening, we proceed in complete darkness towards the small square where the show, organised as part of a street art festival, is about to begin. Maxime is leading the group and walking in front of us, holding a torch. He talks a lot. It's not every day that tourists and other curious onlookers lose their way in the Aygalades, one of the "priority neighbourhoods" of Marseille. If they do, it's only because they are here for the European street art festival Travellings. Once a year, the festival takes over the Cité des arts et de la rue in the Aygalades. The neighbourhood is located in the 15th arrondissement of Marseille and is among what people call the "neighbourhoods of the North", a way in which to outline the more dangerous areas of France's second town. At first glance, the Aygalades is just a group of awful yellowish housing blocks, with a highway dividing the neighbourhood in two like a mini Berlin wall. But take a closer look and you'll see curious kids, stories of immigrant families, teenagers like Nas' and Ryan who smoke and dream about becoming famous rappers, laundry hung on clothes lines and curious residents popping their heads out of their windows to watch the incoming horde of young (and old) artsy hipsters with their totes bags march in from the city centre. 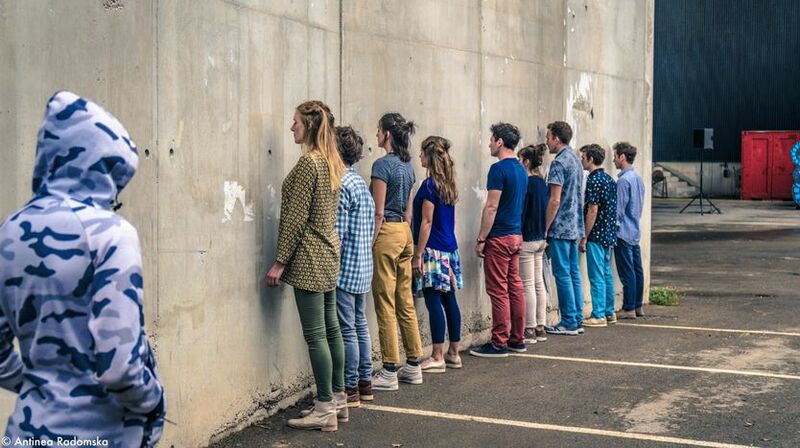 For the fourth edition of Travellings in 2017, which was organised by Lieux publics, artists from all over the world gathered in the Aygalades in an effort to merge the local population and artists from the Old Continent. There is Marco Barotti from Italy, who uses android birds to receive waves from smartphones. There is Veronika Tzekova from Bulgaria who is organising a football match between four teams at the Stade de l'Oasis in the neighbourhood she "can't quite pronounce the name of" and then there's Alexandros Mistriotis, a Greek story-teller who reads poetry in front of a sunset, the social housing serving as a horizon in the background. The setting is calm and the atmosphere is magical. We watch the Austrian dancers from Liquid Loft set up their stage on the promenade of the Cité des Arts for their show Foreign Tongues. It's an intimate event; the audience and the artists know each other. In the evening, a decorated bus has been put at the entrance of the refreshment stall to welcome the public who can knock back some beers and enjoy homemade dinners between two shows. It's a bit of a mess tonight at the park. 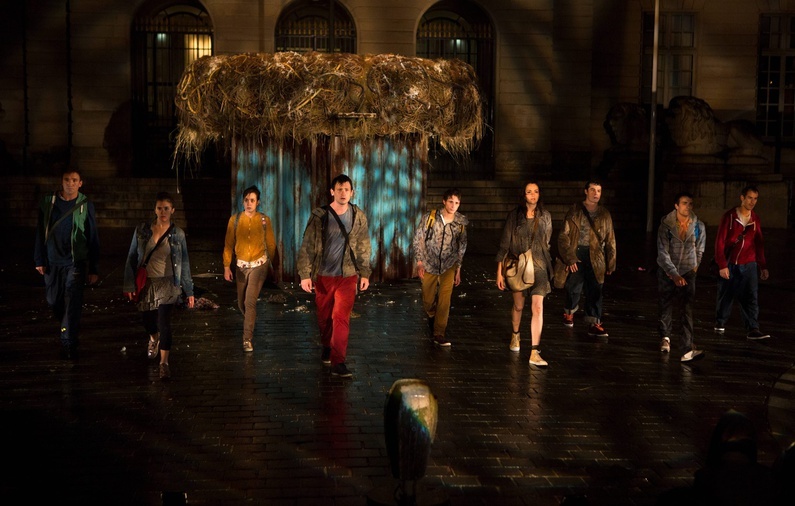 A big nest made of straw has been put right in the middle of a playground and that's where the dancers of the Parisian company ADHOK are about to begin their show Immortels (Le Nid et L'Envol) about the difficulties of being a teenager in 2017. In the crowd there are kids of all ages offering crisps to the spectators who have come from afar. We can hear firecrackers left and right. "It's difficult. We have to adapt to this new environment, there were some pretty agitated young people tonight. We perform in a hermetic space, a closed nest, so we can't really know where noises are coming from. You have to be tough to perform in such conditions," one of the dancers says. "But it's rewarding at the same time. Street theatre is a social and cultural phenomenon," another member of the company adds. Once the playground has emptied, the few that came from downtown Marseille sit next to the park to sip a glass of white wine. They are a small group who have come from Paris and Pristina and talk about theatre and Europe. They are surrounded by the comforting lights around the bar, the only light among the dark and empty surroundings. It might feel like social tourism, but Travellings is perhaps the only way to connect the Aygalades to the rest of Europe. Five minutes left and the time has come to return to the shuttle bringing us back downtown. We're all shaken by the diversity of the performances and by the diversity of its inhabitants.